People ask me a lot of questions about photography, and one thing that comes up time and time again is focal issues. I don't talk about it because it's something you kind of start to take for granted once you acquire quality lenses and a skillset to back it. I'll demonstrate with this scene with a challenging focus, and some tips on other ways to achieve focus in your shot. I am not a photographer of 'artistic blurs' , so in my shots I like to nail the focus on whatever I have to, in order to sell the idea of the image. 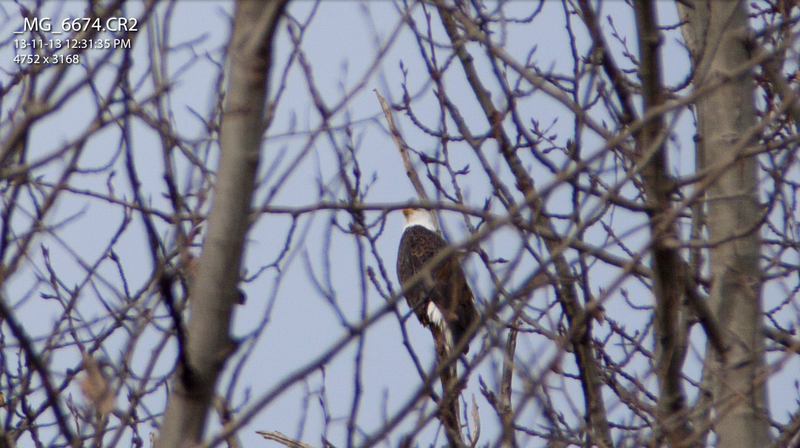 Bald eagle in a tree, took it last week when I was on a walk and thought of this subject to blog about. Not a great photo, in that I mean it doesn't present the eagle, trees or sky in any sort of interesting manner. But one interesting thing is nailing the focus through branch like that. b. For lack of a better name, 'my theory of relativity' trick. It's only a theory, but I use it at nighttime all the time. You are shooting the stars, but how far away are they? Well infinity as far as your lens is concerned, but then again, so is probably the bright glow you can see in the city across the water, or something else for that matter. And since your camera's auto focus runs on contrast between neighbouring points to create focus, pointing it at something bright, in the dark is just what you need. So when I am shooting pictures by the lake at night, I'll pull focus from the well lit bridge, lets say, which in theory is relatively the same distance. This 'theory' needs a little understanding of hyperfocal distance, since one contrasted object you use to focus a lens at 28mm is not going to help you focus a lens at 300mm. Learn to use it and it works every time. c. Manual Focus. Sounds harder? It's how I dealt with the eagle above actually. 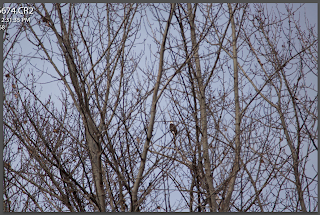 In the scenario above, I could plainly see the big branch in front of the eagle, and I knew my camera would want to focus on that more than the eagle, but that's cool canon. Near your thumb on your right hand when shooting, you might have a little af-lock button. So hit that on the branch, and then push my focus manually a little bit past - it will look right if your viewfinder is clear. Now as long as you are holding the af-lock, you can recompose every shot, and the focus wont change. This is the same as flicking from AF to MF on the lens, but sometimes I opt for the right thumb instead of fumbling with my left hand looking for the switch on lens. Ps. 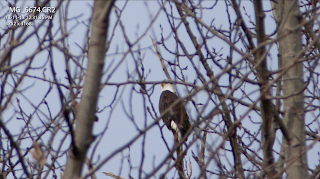 With all the fallen leaves, the nests of two bald eagles become very apparent in my area. This was one of them, a friend was with her, but they separated when I arrived. I am hoping to photograph them more for your enjoyment!